Spirulina is the most commonly used type of blue-green algae, a nutrient-rich aquatic plant. 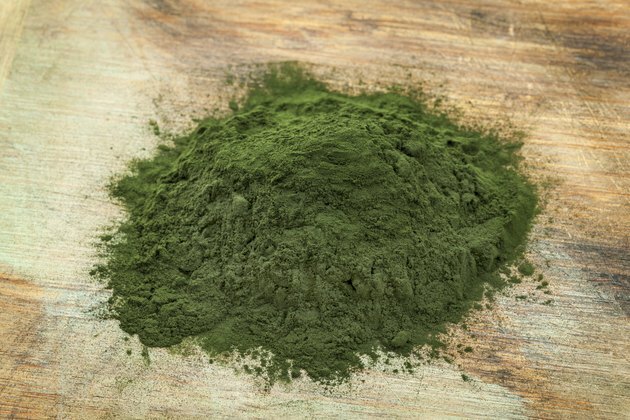 Health supplements containing spirulina are purported to boost immune function, increase protein intake and protect against liver problems. However, these potential medicinal uses of spirulina have not been sufficiently supported with research data. If you have questions regarding how much spirulina you should consume, consult your medical provider. Health professionals with the University of Maryland Medical Center report that the standard dose of spirulina for adults is four to six 500-milligrams tablets per day; however, the amount of spirulina you should consume may vary depending upon your age and health needs. In addition to tablets, powder and flake forms of spirulina are available. Additional research is needed to identify the appropriate dosage ranges for spirulina supplements. The safety and effectiveness of spirulina have not been evaluated in children or pregnant or lactating women. Children and expectant mothers should not take spirulina without first consulting a medical provider. Due to the presence of phenylalanine in spirulina, people with phenylketonuria, also called PKU, should not take this supplement. Additionally, avoid taking spirulina if you have an autoimmune disease such as rheumatoid arthritis, multiple sclerosis or lupus. Spirulina may exacerbate the symptoms associated with your autoimmune condition. When used appropriately, spirulina typically doesn't cause side effects. Infrequently, spirulina may cause mild stomach upset, nausea, anxiety or difficulty sleeping. This type of blue-green algae is susceptible to contamination by toxins produced by Microcystis algae. If you consume spirulina that is contaminated with anatoxin, microcystins or saxitoxin, you may experience severe side effects, the Memorial Sloan-Kettering Cancer Center warns. Cyanotoxin contamination may cause pancreas inflammation, heart muscle damage, breathing difficulties, kidney failure, liver toxicity, nerve damage and seizures. In the absence of appropriate medical treatment, these side effects may be life-threatening. If you take certain medications, treatment with spirulina supplements may not be appropriate for you. Avoid taking spirulina in conjunction with immunosuppressant drugs, including methotrexate, prednisone, adalimumab, azathioprine, etanercept and infliximab, the UMMC warns. Spirulina may boost the function of your immune system and may counteract the effects of these medications.